Written by Janet Choi on August 28, 2015 . VideoBlocks has A/B tested millions of emails — and that’s just since 2013 when Bill Zhang joined the company as its director of lifecycle marketing. What has he learned? 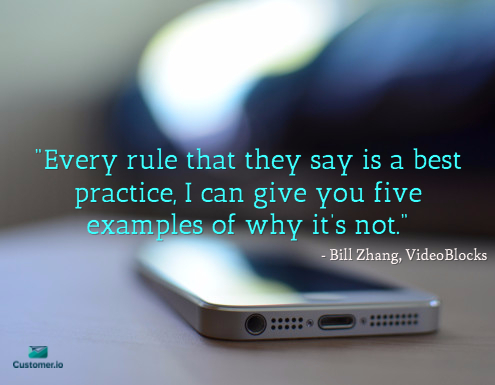 “Every rule that they say is a best practice, I can give you five examples of why it’s not,” he reports. Testing is huge at VideoBlocks, which provides a subscription service for downloading stock video, backgrounds, and effects (its sister sites, GraphicStock and AudioBlocks, provide images and sound). In fact, being data-driven is a stated company value — and it’s this approach centered around data, testing, and iteration that’s helped build this fast-growing, multimillion dollar company. “We test something and if it works, we go with it, even though it might be the most ugly creative or template,” Bill explains. For VideoBlocks, continuous email testing is a way to listen, find out what the customer wants, and keep steering towards more relevance — which, of course, is the key to successful email marketing. For some onboarding emails, the company features a customer representative’s face in the signature to humanize the message and to help build trust with new users. They A/B-tested whether showing a female or male customer representative would make an impact. The answer: it depends. 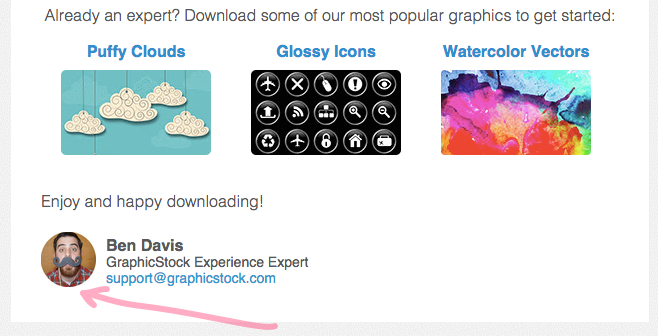 It turns out that for Videoblocks, the female picture won, and for GraphicStock, the male picture won. [T]he data that is most relevant to your company’s future success is your own data. Especially in the Age of Big Data, marketers have tons of information about their subscriber and customer behavior at their disposal.